MobileCaddy is a Mobile Innovation Award-winning product company focused on helping mobile app developers in the Salesforce ecosystem. Their primary product, also named MobileCaddy, allows Salesforce consultancies and partners to rapidly build next-generation offline-first hybrid applications, standardized on Ionic, with a toolset primarily built to support the Ionic framework. When global fashion brand Diesel, a Salesforce client, reached the limitations of their Salesforce1 pre-packaged mobile app, Diesel leadership realized they needed an app that was robust enough to deliver on the needs of their workforce, with a more intuitive UX. MobileCaddy built a new Diesel mobile app using Ionic in six weeks, then developed a further three versions based on newly identified needs over the next few months thanks to the solution’s built-in versioning capability. 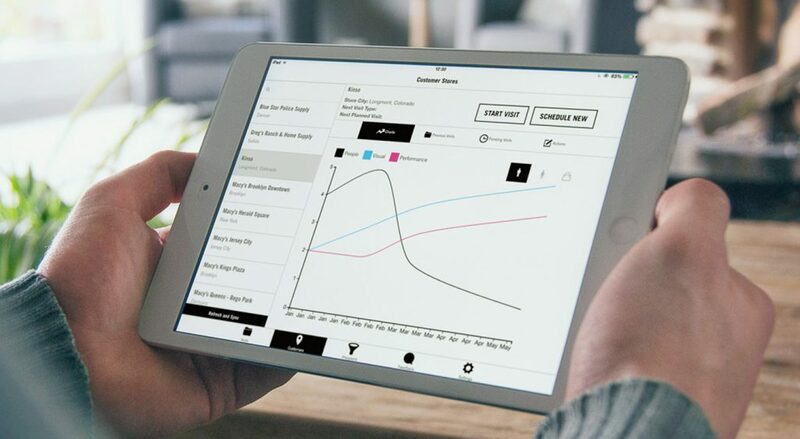 The resulting app helps Diesel’s merchandising team report on and analyze each store’s and and product’s performance during store visits and identify new ways to positively represent the Diesel brand. MobileCaddy delivered the key “offline-first” functionality and custom UX/UI that were required to salvage Diesel’s initial investment in Salesforce mobile. The MobileCaddy app now uses the Salesforce Mobile SDK, network information, orientation lock, and camera plugins. “The Salesforce Mobile SDK plugin allowed us to hugely reduce the work needed to handle user authentication into Salesforce.com, as well as supporting an encrypted SQLite database interface out of the box,” says Todd. MobileCaddy CEO Justin Halfpenny adds that the UI had to mask both the complexity of the processes and the large quantities of records in the app. The Diesel app uses MobileCaddy’s OTA-style app updates for apps and offline-first behaviour, which was needed due to the environment in which users’ line-of-business tasks occur. At the time, Diesel only needed an iOS app. “There was still the potential of a change in device policy going forward, so this was handled by using Ionic with Cordova, meaning there was a single codebase to ensure no further cost for Diesel if the devices were changed to Android or Windows down the line,” says Justin, who notes that this is a key requirement for the enterprise, where purchasing and device policies can change, and companies don’t want to have to rebuild their apps every time there’s a change. “We believe Ionic is the best hybrid framework for us to offer to Salesforce enterprise clients, because it has the benefit of being stress-tested across large quantities of consumer-based users, along with the flexibility and speed that enterprise-grade apps need,” says Justin. Diesel’s project team couldn’t believe the app was a hybrid app, thanks to its speed and UI. “Ionic’s focus on performance, plus the incredible team and community that has grown around it, has really impressed us,” says Todd. ← Build a WhatsApp Clone with Ionic 2, Angular 2, and Meteor!